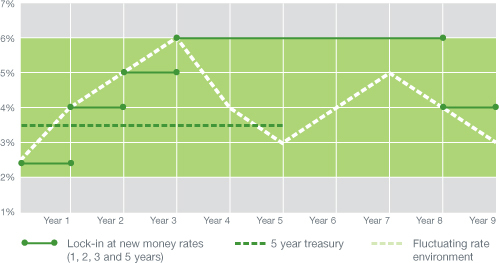 Interest rate adjustment can be positive or negative, depending on the direction of rates if liquidated before the maturity date of the guarantee period. With a traditional 5-year investment the investor maintains the same rate for the 5-year period. If rates go down, the investor maintains the higher rate. If rates go up, the investor remains at the lower rate. With the Guaranteed Rate Plan the investor can maintain the same rate with control over the guarantee period. If the individual believe rates will go up, he or she can renew for one year. If he or she believes rates will go down, the investor can lock-in for a period of 2, 3 or 5 years. The interest rates shown are hypothetical and should not be viewed as an indicator of future rates. Liquidity After the first plan year, you can redeem up to 10% of total investments, less any prior withdrawals and any associated charges, in any plan year without charge. No redemption charge after the fifth plan year; however, an interest rate adjustment may apply if redemptions are made prior to the end of a guarantee period. 1Payment of the Wealth Transfer Value is subject to the claims-paying ability of Old Mutual (Bermuda) Ltd., the issuing company. 2Not available to residents or citizens of the U.S. or Bermuda.